learning as a goal rather than an incidental outcome." Although the intentional learner is self-directed, instructors can help create environments better suited for intentional learning. 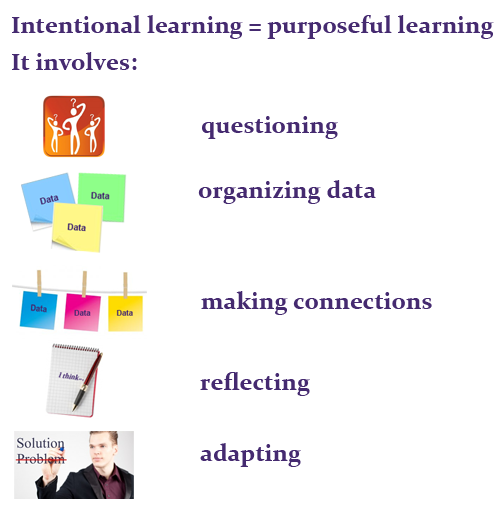 An intentional learning environment is one which fosters activity and feedback and creates a culture that fosters metacognition, i.e., one in which the learner becomes aware of his or her learning process and can use to tools (mental or technological) to enhance this learning process. According to intentional learning theory, it's less important for the learner to pass tests than it is for the learner to be able to organize and apply knowledge. (Bereiter & Scardamalia, 1989).